Durable, inflatable Pea Pod Jr. is made with super-strong vinyl and has tough triple-welded seams for added strength. Most children can get in the “pod" themselves, applying deep, even pressure to many sensitive areas of the body. 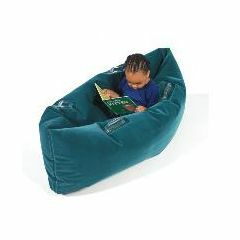 Some children like to gently rock side-to-side for a “cocooning-calm.” The velvety surface is made with comfortable flocked vinyl. Surface-washable. 48" (112 cm). Deep pressure input . Calming. Easy to inflate. Easy for kids to get into. This was purchased to use with a young child with sensory processing difficulties. It works well for this student and is able to be used with adult supervision. It was easy to inflate and lightweight once inflated, making it easy to move between locations when needed. It has not been used long enough to know if this will be problematic but others have noted that if it leaks, it does so at the seams. It appears that the newest product has thicker seams so hopefully this will not be a concern.